In the late nineteenth century, George Allart trained as a patternmaker with the renowned brassfounder, James Collins. He then later joined another Birmingham brassfounder Edwin Showell & Sons as their works manager. In 1914 George began his own business working from a small workshop within the premises of a company owned by a family friend. At the end of the First World War he set up in Balsall Heath, Birmingham manufacturing brassfoundry for the architectural, marine and railway trades. His son, Frank, joined the family firm as an apprentice patternmaker in 1917, at the age of fourteen. Amongst their early specialties, Allart designed and developed a large variety of fittings for metal windows, a market they had largely to themselves until meeting competition from Smith Wallis & Co. in the 1930’s. In 1935 they moved to larger premises in Ladywood, Birmingham, which was to be their home for the next sixty years. At the beginning of the Second World War, George found it difficult to secure war work for his factory. However, The Birmingham Guild Ltd, their next door neighbours, were heavily engaged on aircraft work and a hole was knocked into the wall between the two factories and the two firms worked together for the next six years to support the war effort. 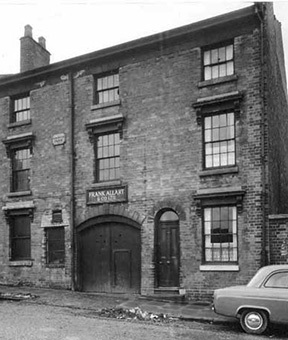 At the end of hostilities in Europe Frank re-registered the business as Frank Allart & Company Limited in September 1945, the name it has to this day. From the 1950’s through to the 1980’s Frank Allart was producing architectural hardware in a variety of materials including brass, bronze, aluminium and zinc. The company was very innovative during this time and held several patents and registered designs for door furniture, letter plates, and various door bolts. Their 5640 flush bolt became a particular success with annual sales in excess of a quarter of a million pieces throughout the 1970’s and 1980’s. This design of bolt action is now ubiquitous in the hardware industry, but very few would know that this was actually an invention designed and patented by Frank Allart himself. Frank retired in 1971, although retaining his connection with the company as Chairman. His son John, who had started in the business in 1962, took control. The early 1970’s were a difficult time for manufacturing businesses and the company was not immune to the economic pressures this brought. In 1976, in an effort to keep the business intact and secure the jobs of its loyal workforce, Frank Allart offered the business to Harold McGrail, a local businessman with a small group of businesses specializing in the manufacture of reproduction furniture fittings, giftware and other brassfoundry products. So, after 62 years in the ownership of the Allart family, the business became part of the Armac Brassfounders Group. Significant investment immediately followed to stabilize the finances and secure the futures of business and its workforce. In 1995 the company moved into a much larger purpose built modern manufacturing facility within the same Ladywood district of Birmingham. 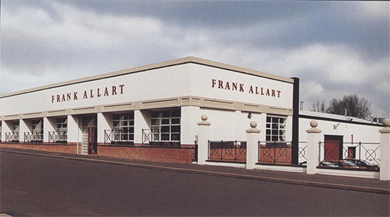 A substantial investment was made to upgrade both production and finishing equipment to enable Frank Allart to stay at the forefront of high quality architectural hardware manufacture. From the mid-nineties to the present day, the company continues to invest in all aspects of the business – CNC machinery, Electroplating, CAD design facilities, MRP & CRM systems, and the education and training of all its personnel.